Hurricane Katrina was the costliest and one of the deadliest hurricanes in the history of the United States. It was the sixth-strongest Atlantic hurricane ever recorded and the third-strongest landfalling U.S. hurricane on record. Katrina formed in late August during the 2005 Atlantic hurricane season and caused devastation along much of the north-central Gulf Coast of the United States. Most notable in media coverage were the catastrophic effects on the city of New Orleans, Louisiana, and in coastal Mississippi. Due to its sheer size, Katrina devastated the Gulf Coast as far as 100 miles (160 km) from the storm's centre. Katrina is the third major hurricane, and second Category 5 hurricane of the 2005 Atlantic season. It formed over the Bahamas on August 23, 2005, and crossed southern Florida as a moderate Category 1 hurricane, causing some deaths and flooding there, before strengthening rapidly in the Gulf of Mexico and becoming one of the strongest hurricanes on record. The storm weakened considerably before making its second and third landfalls as a Category 3 storm on the morning of August 29 in southeast Louisiana and at the Louisiana/Mississippi state line, respectively. The storm surge caused severe and catastrophic damage along the Gulf coast, devastating the cities of Mobile, Alabama, Waveland and Biloxi/ Gulfport in Mississippi, and New Orleans and other towns in Louisiana. Levees separating Lake Pontchartrain and several canals from New Orleans were breached by the surge, ultimately flooding 80% of the city and many areas of neighboring parishes for weeks. Severe wind damage was reported well inland. At least 1,836 people lost their lives in Hurricane Katrina and in the subsequent floods, making it the deadliest U.S. hurricane since the 1928 Okeechobee Hurricane. The storm is estimated to have been responsible for $81.2 billion (2005 U.S. dollars) in damage, making it the costliest natural disaster in U.S. history. Criticism of the federal, state and local governments' reaction to the storm was widespread and resulted in an investigation by the United States Congress and the resignation of FEMA director Michael Brown. Hurricane Katrina formed as Tropical Depression Twelve over the southeastern Bahamas on August 23, 2005 as the result of an interaction of a tropical wave and the remains of Tropical Depression Ten. The system was upgraded to tropical storm status on the morning of August 24 and at this point, the storm was given the name Katrina. The tropical storm continued to move towards Florida, and became a hurricane only two hours before it made landfall between Hallandale Beach and Aventura, Florida on the morning of August 25. The storm weakened over land, but it regained hurricane status about one hour after entering the Gulf of Mexico. The storm rapidly intensified after entering the Gulf, partly because of the storm's movement over the warm waters of the Loop Current. On August 27, the storm reached Category 3 intensity on the Saffir-Simpson Hurricane Scale, becoming the third major hurricane of the season. An eyewall replacement cycle disrupted the intensification, but caused the storm to nearly double in size. Katrina again rapidly intensified, attaining Category 5 status on the morning of August 28 and reached its peak strength at 1:00 p.m. CDT that day, with maximum sustained winds of 175 mph (280 km/h) and a minimum central pressure of 902 mbar. The pressure measurement made Katrina the fourth most intense Atlantic hurricane on record at the time, only to be surpassed by Hurricanes Rita and Wilma later in the season; it was also the strongest hurricane ever recorded in the Gulf of Mexico at the time (a record also later broken by Rita). Katrina made its second landfall at 6:10 a.m. CDT on August 29 as a Category 3 hurricane with sustained winds of 125 mph (205 km/h) near Buras-Triumph, Louisiana. At landfall, hurricane-force winds extended outward 120 miles (190 km) from the centre and the storm's central pressure was 920 mbar. After moving over southeastern Louisiana and Breton Sound, it made its third landfall near the Louisiana/Mississippi border with 120 mph (195 km/h) sustained winds, still at Category 3 intensity. Katrina maintained hurricane strength well into Mississippi, but weakened thereafter, finally losing hurricane strength more than 150 miles (240 km) inland near Meridian, Mississippi. It was downgraded to a tropical depression near Clarksville, Tennessee, but its remnants were last distinguishable in the eastern Great Lakes region on August 31, when it was absorbed by a frontal boundary. The resulting extratropical storm moved rapidly to the northeast and affected Ontario and Quebec. Many people living in the area were unaware of when Katrina strengthened from a tropical storm to a hurricane in one day and struck southern Florida near the Miami-Dade– Broward county line. The hurricane struck between the cities of Aventura, in Miami-Dade County, and Hallandale, in Broward County, on August 25, 2005. 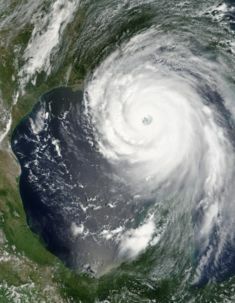 However, National Hurricane Centre (NHC) forecasts had correctly predicted that Katrina would intensify to hurricane strength before landfall, and hurricane watches and warnings were issued 31.5 hours and 19.5 hours before landfall, respectively — only slightly less than the target thresholds of 36 and 24 hours. Florida Governor Jeb Bush declared a state of emergency on August 24 in advance of Katrina's landfall in Florida. Shelters were opened and schools closed in several counties in the southern part of the state. A number of evacuation orders were also issued, mostly voluntary, although a mandatory evacuation was ordered for at-risk housing in Martin County. 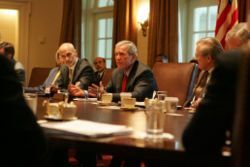 Flanked by Michael Chertoff, Secretary of Homeland Security, left, and Secretary of Defense Donald Rumsfeld, President George W. Bush meets with members of the White House Task Force on Hurricane Katrina Recovery on August 31, 2005, in the Cabinet Room of the White House. On the morning of August 26, at 10 a.m. CDT (1500 UTC), Katrina had strengthened to a Category 3 storm in the Gulf of Mexico. Later that afternoon, the NHC realized that Katrina had yet to make the turn toward the Florida Panhandle and ended up revising the predicted track of the storm from the panhandle to the Mississippi coast. The NHC issued a hurricane watch for southeastern Louisiana, including the New Orleans area at 10 a.m. CDT August 27. That afternoon the NHC extended the watch to cover the Mississippi and Alabama coastlines as well as the Louisiana coast to Intracoastal City. The United States Coast Guard began pre-positioning resources beyond the expected impact zone starting on August 26, and activated more than 400 reservists. Aircrews from the Aviation Training Centre, in Mobile, staged rescue aircraft from Texas to Florida. All aircraft were returning back towards the Gulf of Mexico by the afternoon of August 29. Air crews, many who lost their homes during the hurricane, began a round-the-clock rescue effort in New Orleans, and along the Mississippi and Alabama coastlines. President George W. Bush declared a state of emergency in Louisiana, Alabama, and Mississippi two days before the hurricane made landfall. That same evening, the NHC upgraded the section of the hurricane watch from Morgan City, Louisiana to the Alabama-Florida border to a hurricane warning, 12 hours after it was issued, and also issued a tropical storm warning for the westernmost Florida Panhandle. On August 28, as the sheer size of Katrina became clear, the NHC extended the tropical storm warning zone to cover most of the Louisiana coastline and a larger proportion of the Florida Panhandle. The National Weather Service's New Orleans/Baton Rouge office issued a vividly-worded bulletin predicting that the area would be "uninhabitable for weeks" after "devastating damage" caused by Katrina, which at that time rivaled the intensity of Hurricane Camille. Voluntary and mandatory evacuations were issued for large areas of southeast Louisiana as well as coastal Mississippi and Alabama. About 1.2 million residents of the Gulf Coast were covered under a voluntary or mandatory evacuation order. On August 26, the state of Mississippi activated its National Guard in preparation of the storm's landfall. Additionally, the state government activated its Emergency Operations Centre the next day, and local governments began issuing evacuation orders. By 7:00 p.m. EDT on August 28, 11 counties and eleven cities issued evacuation orders, a number which increased to 41 counties and 61 cities by the following morning. Moreover, 57 emergency shelters were established on coastal communities, with 31 additional shelters available to open if needed. Louisiana's hurricane evacuation plan calls for local governments in areas along and near the coast to evacuate in three phases, starting with the immediate coast 50 hours before the start of tropical storm force winds. Persons in areas designated Phase II begin evacuating 40 hours before the onset of tropical storm winds and those in Phase III areas (including New Orleans) evacuate 30 hours before the start of such winds. However, many private care-taking facilities that relied on bus companies and ambulance services for evacuation were unable to evacuate their charges. Fuel and rental cars were in short supply and many forms of public transportation had been shut down well before the storm arrived. Some estimates claimed that 80% of the 1.3 million residents of the greater New Orleans metropolitan area evacuated, leaving behind substantially fewer people than remained in the city during the Hurricane Ivan evacuation. By Sunday, August 28, most infrastructure along the Gulf Coast had been shut down, including all Canadian National Railway and Amtrak rail traffic into the evacuation areas as well as the Waterford Nuclear Generating Station. The NHC maintained the coastal warnings until late on August 29, by which time Hurricane Katrina was over central Mississippi. Vertical cross-section of New Orleans, showing maximum levee height of 23 feet (7 m). By August 26, the possibility of unprecedented cataclysm was already being considered. Many of the computer models had shifted the potential path of Katrina 150 miles westward from the Florida Panhandle, putting the city of New Orleans right in the centre of their track probabilities; the chances of a direct hit were forecast at 17%, with strike probability rising to 29% by August 28. This scenario was considered a potential catastrophe because 80% of the city of New Orleans and the Metro area on the southern shore is below sea level along Lake Pontchartrain. Since the storm surge produced by the hurricane's right-front quadrant (containing the strongest winds) was forecast to be 28 feet (8.5 m), emergency management officials in New Orleans feared that the storm surge could go over the tops of levees protecting the city, causing major flooding. This risk of devastation was well known; previous studies by FEMA and the Army Corps of Engineers had warned that a direct hurricane strike on New Orleans could lead to massive flooding, which would lead to thousands of drowning deaths, as well as many more suffering from disease and dehydration as the flood waters slowly receded from the city. At a news conference at 10:00 a.m. on August 28, shortly after Katrina was upgraded to a Category 5 storm, New Orleans mayor Ray Nagin ordered the first ever mandatory evacuation of the city, calling Katrina "a storm that most of us have long feared." The city government also established several "refuges of last resort" for citizens who could not leave the city, including the massive Louisiana Superdome, which sheltered approximately 26,000 people and provided them with food and water for several days as the storm came ashore. On August 29, Katrina's storm surge caused several breaches in levees around New Orleans. Most of the city was subsequently flooded, as the breached drainage and navigation canals allowed water to flow from the lake into low areas of the city and Saint Bernard Parish. Storm surge also devastated the coasts of Mississippi and Alabama, making Katrina the most destructive and costliest natural disaster in the history of the United States, and the deadliest hurricane since the 1928 Okeechobee Hurricane. The total damage from Katrina is estimated at $81.2 billion (2005 U.S. dollars), nearly double the cost of the previously most expensive storm, Hurricane Andrew, when adjusted for inflation. As of May 19, 2006, the confirmed death toll (total of direct and indirect deaths) stood at 1,836, mainly from Louisiana (1,577) and Mississippi (238). However, 705 people remain categorized as missing in Louisiana, so this number is not final even a year after the storm. Many of the deaths are indirect, but it is almost impossible to determine the exact cause of some of the fatalities. Federal disaster declarations covered 90,000 square miles ( 233,000 km²) of the United States, an area almost as large as the United Kingdom. The hurricane left an estimated three million people without electricity. On September 3, 2005, Homeland Security Secretary Michael Chertoff described the aftermath of Hurricane Katrina as "probably the worst catastrophe, or set of catastrophes," in the country's history, referring to the hurricane itself plus the flooding of New Orleans. 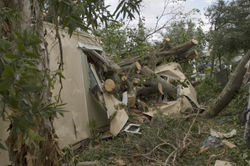 Damage to a mobile home in Davie, Florida following Hurricane Katrina. Hurricane Katrina first made landfall on August 25 in South Florida where it hit as a Category 1 hurricane, with 80 mph (130 km/h) winds. Rainfall was heavy in places and exceeded 14 inches (350 mm) in Homestead, Florida, and a storm surge of 3–5 feet was measured in parts of Monroe County. More than 1 million customers were left without electricity, and damage in Florida was estimated at between 1 and 2 billion dollars, with most of the damage coming from flooding and overturned trees. There were 11 fatalities reported in Florida as a result of Hurricane Katrina. Most of the Florida Keys experienced tropical-storm force winds from Katrina as the storm's centre passed to the north, with hurricane force winds reported in the Dry Tortugas. Rainfall was also high in the islands, with 10 inches (250 mm) falling on Key West. On August 26, a strong F1 tornado formed from an outer rain band of Katrina and struck Marathon. The tornado damaged a hangar at the airport there and caused an estimated 5 million dollars in damage. Although Hurricane Katrina stayed well to the north of Cuba, on August 29 it brought tropical-storm force winds and rainfall of over 8 inches (200 mm) to western regions of the island. Telephone and power lines were damaged and around 8,000 people were evacuated in the Pinar del Río Province. According to Cuban television reports the coastal city of Surgidero de Batabano was 90% underwater. On August 29 Hurricane Katrina made landfall near Buras, Louisiana with 125 mph (205 km/h) winds, as a strong Category 3 storm. However, as it had only just weakened from Category 4 strength and the radius of maximum winds was large, it is possible that sustained winds of Category 4 strength briefly impacted extreme southeastern Louisiana. Although the storm surge to the east of the path of the eye in Mississippi was higher, a very significant surge affected the Louisiana coast. The height of the surge is uncertain because of a lack of data, although a tide gauge in Plaquemines Parish indicated a storm tide in excess of 14 feet (4.3 m) and a 12 foot (3 m) storm surge was recorded in Grand Isle. Hurricane Katrina also brought heavy rain to Louisiana, with 8-10 inches (200-250 mm) falling on a wide swath of the eastern part of the state. In the area around Slidell, the rainfall was even higher, and the highest rainfall recorded in the state was approximately 15 inches (380 mm). As a result of the rainfall and storm surge the level of Lake Pontchartrain rose and caused significant flooding along its northeastern shore, affecting communities from Slidell to Mandeville. Several bridges were destroyed, including the I-10 Twin Span Bridge connecting Slidell to New Orleans. Almost 900,000 people in Louisiana lost power as a result of Hurricane Katrina. In hard-hit St. Bernard Parish, which was entirely flooded by Katrina, the search for the missing was slow. According to an interview in the New Orleans Times-Picayune, the coroner was still trying to get a list of missing from the Red Cross in November 2005. While there were some victims on this list whose bodies were found in their homes, the vast majority were tracked down through word-of-mouth and credit card records. As of December 2005, the official missing list in the Parish stood at 47. As the eye of Hurricane Katrina swept to the northeast, it subjected the city to hurricane conditions for hours. Although power failures prevented accurate measurement of wind speeds in New Orleans, there were a few measurements of hurricane-force winds. From this the NHC concluded that it is likely that much of the city experienced sustained winds of Category 1 or Category 2 strength. However, wind speeds increase with height, and therefore the winds experienced on upper floors of high rise structures were likely to have been significantly higher. 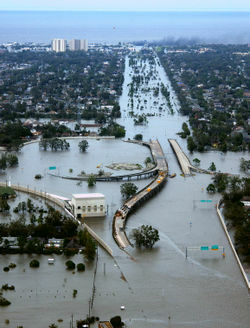 The heavy winds and storm surges from Katrina severely weakened the city's levee system, and there were reports of extensive failures of the levees and flood walls protecting New Orleans, Louisiana and surrounding communities. The Mississippi River Gulf Outlet (MR-GO) breached its levees in approximately 20 places, flooding much of east New Orleans(EAST SIDE), most of Saint Bernard Parish and the East Bank of Plaquemines Parish. The major levee breaches in the city included breaches at the 17th Street Canal levee, the London Avenue Canal, and the wide, navigable Industrial Canal, which left approximately 80% of the city flooded. Most of the major roads traveling into and out of the city were damaged. The only routes out of the city were the westbound Crescent City Connection and the Huey P. Long Bridge, as the I-10 Twin Span Bridge traveling eastbound towards Slidell, Louisiana had collapsed. The Lake Pontchartrain Causeway only carried emergency traffic. On August 29, at 7:40 a.m. CDT, it was reported that most of the windows on the north side of the Hyatt Regency New Orleans had been blown out, and many other high rise buildings had extensive window damage. The Hyatt was the most severely damaged hotel in the city, with beds reported to be flying out of the windows. Insulation tubes were exposed as the hotel's glass exterior was completely sheared off. 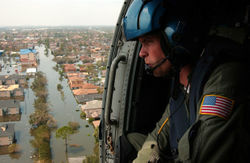 A U.S. Coast Guardsman searches for survivors in New Orleans in the aftermath of Katrina. The Superdome, which was sheltering a large number of people who had not evacuated, sustained significant damage. Two sections of the Superdome's roof were compromised and the dome's waterproof membrane had essentially been peeled off. Louis Armstrong New Orleans International Airport was closed before the storm but did not flood. On August 30, it was reopened to humanitarian and rescue operations. Limited commercial passenger service resumed at the airport on September 13 and regular carrier operations resumed in early October. Katrina also caused widespread loss of life, with over 700 bodies recovered in New Orleans by October 23. Some survivors and evacuees reported seeing dead bodies lying in city streets and floating in still-flooded sections, especially in the east of the city. The advanced state of decomposition of many corpses, some of which were left in the water or sun for days before being collected, hindered efforts by coroners to identify many of the dead. The first deaths reported from the city were reported shortly before midnight on August 28, as three nursing home patients died during an evacuation to Baton Rouge, most likely from dehydration. While there were also early reports of fatalities amid mayhem at the Superdome, only six deaths were confirmed there, with four of these originating from natural causes, one from a drug overdose, and one a suicide. At the Convention Centre, four bodies were recovered. One of the four is believed to be the result of a homicide. U.S. Highway 90's Bay St. Louis Bridge on Pass Christian was destroyed as a result of Katrina. The Gulf coast of Mississippi suffered massive damage from the impact of Hurricane Katrina on August 29, leaving 238 people dead, 67 missing, and billions of dollars in damages. Afterwards, the lower 47 counties in Mississippi were declared disaster areas for federal assistance. 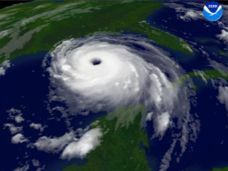 After making a brief initial landfall in Louisiana, Katrina made its final landfall near the state line and the eyewall passed over the cities of Bay St. Louis and Waveland as a Category 3 hurricane with sustained winds of 120 mph (195 km/h). Katrina's powerful right-front quadrant passed over the west and central Mississippi coast causing a powerful 27 foot (8.2 m) storm surge, which penetrated 6 miles (10 km) inland in many areas and up to 12 miles (20 km) inland along bays and rivers; in some areas, the surge crossed Interstate 10 for several miles. Hurricane Katrina brought strong winds to Mississippi which caused significant tree damage throughout the state. The highest unofficial reported wind gust recorded from Katrina was one of 135 mph (217 km/h) in Poplarville, in Pearl River County. 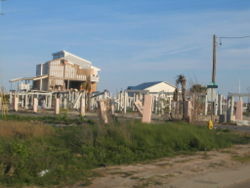 Damage to Long Beach, Mississippi following Hurricane Katrina. The storm also brought heavy rains with 8-10 inches (200-250 mm) falling in southwestern Mississippi and rain in excess of 4 inches (100 mm) falling throughout the majority of the state. Katrina caused eleven tornadoes in Mississippi on August 29, some of which damaged trees and power lines. Battered by wind, rain and storm surge, some beachfront neighborhoods were completely leveled. Preliminary estimates by Mississippi officials calculated that 90% of the structures within half a mile of the coastline were completely destroyed, and that storm surges traveled as much as six miles inland in portions of the state's coast. One apartment complex with approximately thirty residents seeking shelter inside collapsed. More than half of the 13 casinos in the state, which were floated on barges to comply with Mississippi land-based gambling laws, were washed hundreds of yards inland by waves. Surge damage in Pascagoula, Mississippi. A number of streets and bridges were washed away. On U.S. Highway 90 along the Mississippi Gulf Coast, two major bridges were completely destroyed: the Bay St. Louis - Pass Christian bridge, and the Biloxi - Ocean Springs bridge. In addition, the eastbound span of the I-10 bridge over the Pascagoula River estuary was damaged. In the weeks after the storm, with the connectivity of the coastal U.S. Highway 90 shattered, traffic traveling parallel to the coast was reduced to two lanes on the remaining I-10 span. All three coastal counties of the state were severely affected by the storm. Katrina's surge was the most extensive, as well as the highest, in the documented history of the United States; large portions of both Hancock and Jackson Counties were inundated by the storm surge, in both cases affecting most of the populated areas. Surge covered almost the entire lower half of Hancock County, destroying the coastal communities of Clermont Harbour and Waveland, much of Bay St. Louis, and flowed up the Jourdan River, flooding Kiln. In Harrison County, Pass Christian was completely inundated, along with a narrow strip of land to the east along the coast, which includes the cities of Long Beach and Gulfport; the flooding was more extensive in communities such as D'Iberville, which borders Back Bay. Biloxi, on a peninsula between the Back Bay and the coast, was particularly hard hit, especially the low-lying Point Cadet area. In Jackson County, storm surge flowed up the wide river estuary, with the combined surge and freshwater flooding cutting the county in half. Remarkably, over 90% of Pascagoula, the easternmost coastal city in Mississippi, and about 75 miles east of Katrina's landfall near the Louisiana-Mississippi border, was flooded from surge at the height of the storm. Other Jackson County communities such as Porteaux Bay and Gulf Shores were destroyed, and St. Martin was hard hit; Ocean Springs, Moss Point, Gautier, and Escatawpa also suffered major surge damage. Mississippi Emergency Management Agency officials also recorded deaths in Hinds, Warren, and Leake counties. Over 900,000 people throughout the state experienced power outages. Although Hurricane Katrina made landfall well to the west, Alabama and the Florida Panhandle were both affected by a significant storm surge and tropical-storm force winds. Sustained winds of 67 mph (107 km/h) were recorded in Mobile, Alabama and the storm surge there was approximately 10 feet (3 meters). The surge caused significant flooding several miles inland along Mobile Bay. Four tornadoes were also reported in Alabama. 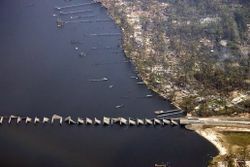 An oil rig under construction along the Mobile River broke its moorings and floated 1.5 miles (2 km) northwards before striking the Cochrane Bridge just outside Mobile. No significant damage resulted to the bridge and it was soon reopened. The damage on Dauphin Island was severe, with the surge destroying many houses and cutting a new canal through the western portion of the island. An offshore oil rig also became grounded on the island. As in Mississippi, the storm surge caused significant beach erosion along the Alabama coastline. More than 600,000 people lost power in Alabama as a result of Hurricane Katrina and two people died in a traffic accident in the state. Along the Florida Panhandle the storm surge was typically about five feet (1.5 m) and along the west-central Florida coast there was a minor surge of 1-2 feet (0.3-0.6 m). In Pensacola, Florida 56 mph (90 km/h) winds were recorded on August 29. The winds caused damage to some trees and structures and there was some minor flooding in the Panhandle. There were two indirect fatalities from Katrina in Walton County as a result of a traffic accident. In the Florida Panhandle, 77,000 customers lost power. 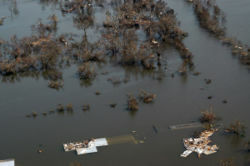 Northern and central Georgia were affected by heavy rains and strong winds from Hurricane Katrina as the storm moved inland, with more than 3 inches (75 mm) of rain falling in several areas. At least 18 tornadoes formed in Georgia on August 29, the most on record in that state for one day in August. The most serious of these tornadoes was a F2 tornado which affected Heard County and Carroll County. This tornado caused 3 injuries and one fatality and damaged several houses. In addition this tornado destroyed several poultry barns, killing over 140,000 chicks. The other tornadoes caused significant damages to buildings and agricultural facilities. In addition to the fatality caused by the F2 tornado, there was another fatality in a traffic accident. Total rainfall from Katrina in the United States. Data for the New Orleans area are not available. Hurricane Katrina weakened as it moved inland, but tropical-storm force gusts were recorded as far north as Fort Campbell, Kentucky on August 30, and the winds damaged trees in New York. The remnants of the storm brought high levels of rainfall to a wide swath of the eastern United States, and rain in excess of 2 inches (50 mm) fell in parts of 20 states. A number of tornadoes associated with Katrina formed on August 30 and August 31, which caused minor damages in several regions. In total, 62 tornadoes formed in eight states as a result of Katrina. Eastern Arkansas received light rain from the passage of Katrina. Gusty winds downed some trees and power lines, though damage was minimal. In Kentucky, a storm that had moved through the weekend before had already produced flooding and the rainfall from Katrina added to this. As a result of the flooding, Kentucky's Governor Ernie Fletcher declared 3 counties disaster areas and a statewide state of emergency. One person was killed in Hopkinsville, Kentucky and part of a high school collapsed. Flooding also prompted a number of evacuations in West Virginia and Ohio, the rainfall in Ohio leading to two indirect deaths. Katrina also caused a number of power outages in many areas, with over 100,000 customers affected in Tennessee, primarily in the Memphis and Nashville areas. The remnants of Katrina merged with a frontal system over Ohio, but the moisture continued north and affected Canada on August 31. In Ontario there were a few isolated reports of rain in excess of 100 mm (4 inches) and there were a few reports of damage from fallen trees. Flooding also occurred both in Ontario and Quebec, cutting off a number of isolated villages in Quebec. The economic effects of the storm were far-reaching. As of April 2006, the Bush Administration has sought $105 billion for repairs and reconstruction in the region, and this does not account for damage to the economy caused by potential interruption of the oil supply, destruction of the Gulf Coast's highway infrastructure, and exports of commodities such as grain. Katrina damaged or destroyed 30 oil platforms and caused the closure of nine refineries; the total shut-in oil production from the Gulf of Mexico in the six-month period following Katrina was approximately 24% of the annual production and the shut-in gas production for the same period was about 18%. The forestry industry in Mississippi was also affected, as 1.3 million acres of forest lands were destroyed. The total loss to the forestry industry from Katrina is calculated to rise to about $5 billion. Furthermore, hundreds of thousands of local residents were left unemployed, which will have a trickle-down effect as fewer taxes are paid to local governments. Before the hurricane, the region supported approximately one million non-farm jobs, with 600,000 of them in New Orleans. It is estimated that the total economic impact in Louisiana and Mississippi may exceed $150 billion. Katrina redistributed New Orleans' population across the southern United States. Houston, Texas, had an increase of 35,000 people; Mobile, Alabama, gained over 24,000; Baton Rouge, Louisiana, over 15,000; and Hammond, Louisiana received over 10,000, nearly doubling its size. Chicago received over 6,000 people, the most of any non-southern city. In late January 2006, about 200,000 people were once again living in New Orleans, less than half of the pre-storm population. Additionally, insurance companies have stopped insuring the area because of the high costs from Hurricanes Katrina and Rita, or have raised insurance premiums to cover their risk. 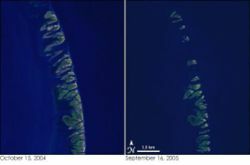 The Chandeleur Islands, before Katrina (left) and after (right), showing the impact of the storm along coastal areas. Katrina also had a profound impact on the environment. The storm surge caused substantial beach erosion, in some cases completely devastating coastal areas. In Dauphin Island, approximately 90 miles (150 km) to the east of the point where the hurricane made landfall, the sand that comprised the barrier island was transported across the island into the Mississippi Sound, pushing the island towards land. The storm surge and waves from Katrina also obliterated the Chandeleur Islands, which had been affected by Hurricane Ivan the previous year. The lands that were lost were also breeding grounds for marine mammals, brown pelicans, turtles, and fish, as well as migratory species such as redhead ducks. Overall, about 20% of the local marshes were permanently overrun by water as a result of the storm. Katrina also forced the closure of 16 National Wildlife Refuges, of which Breton National Wildlife Refuge received the worst damage, as half of its area was swept off. As a result, the hurricane affected the habitats of sea turtles, Mississippi sandhill cranes, Red-cockaded woodpeckers and Alabama Beach mice. Finally, as part of the cleanup effort, the flood waters that covered New Orleans were pumped into Lake Pontchartrain, a process that took 43 days to complete. These residual waters contained a mix of raw sewage, bacteria, heavy metals, pesticides, toxic chemicals, and about 6.5 million U.S. gallons (24.6 million L) of oil, which has sparked fears in the scientific community of massive numbers of fish dying. 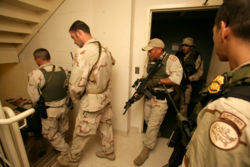 A Border Patrol Special Response Team searches a hotel room-by-room in New Orleans in response to Hurricane Katrina. Shortly after the hurricane moved away on August 30, some residents of New Orleans who remained in the city began looting stores, as did some Mississippi residents in their local stores and casinos. Many looters were in search of food and water that were not available to them through any other means. Reports of carjacking, murders, thefts, and rapes in New Orleans flooded the news. Several news media later determined that most reports were based on rumors. Thousands of National Guard and federal troops were mobilized and sent to Louisiana along with numbers of local law enforcement agents from across the country who were temporarily deputized by the state. "They have M16s and are locked and loaded. These troops know how to shoot and kill and I expect they will," Louisiana Governor Kathleen Blanco said. Congressman Bill Jefferson (D-LA) told ABC News: "There was shooting going on. There was sniping going on. Over the first week of September, law and order was gradually restored to the city." Several shootings were between police and New Orleans residents, including the fatal incident at Danziger Bridge. A number of arrests were made throughout the affected area, including near the New Orleans Convention Centre. A temporary jail was constructed of chain link cages in the city train station. In Texas, where more than 300,000 evacuees are located, local officials have run 20,000 criminal background checks on the evacuees, as well as on the relief workers helping them and people who have opened up their homes. Most of the checks have found little for police to be concerned about. The number of homicides in Houston from September 2005 through February 22, 2006 went up by 23% relative to the same period a year before; 29 of the 170 murders involved displaced Louisianans as a victim, a suspect, or both. 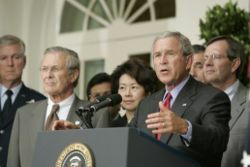 President Bush stands with Secretary of Defense Donald Rumsfeld, Secretary of Labor Elaine Chao and Secretary of Health and Human Services Mike Leavitt during a press conference from the Rose Garden, regarding the devastation along the Gulf Coast caused by Katrina. Within the United States and as delineated in the National Response Plan, disaster response and planning is first and foremost a local government responsibility. When local government exhausts its resources, it then requests specific additional resources from the county level. The request process proceeds similarly from the county to the state to the federal government as additional resource needs are identified. Many of the problems that arose developed from inadequate planning and back-up communications systems at various levels. Some disaster recovery response to Katrina began before the storm, with Federal Emergency Management Agency (FEMA) preparations that ranged from logistical supply deployments to a mortuary team with refrigerated trucks. A network of volunteers began rendering assistance to local residents and residents emerging from New Orleans and surrounding Parishes as soon as the storm made landfall, and has continued for more than six months after the storm. Of the 60,000 people stranded in New Orleans, the Coast Guard rescued over 33,500. Congress recognized the Coast Guard's response with an official entry in the Congressional Record, and the Armed Service was awarded the Presidential Unit Citation. The United States Northern Command established Joint Task Force (JTF) Katrina based out of Camp Shelby, Mississippi, to act as the military's on-scene command on Sunday, August 28. Approximately 58,000 National Guard personnel were activated to deal with the storm's aftermath, with troops coming from all 50 states. The Department of Defense also activated volunteer members of the Civil Air Patrol. Michael Chertoff, Secretary of the Department of Homeland Security, decided to take over the federal, state, and local operations officially on August 30, 2005, citing the National Response Plan. Early in September, Congress authorized a total of $62.3 billion in aid for victims. Additionally, President Bush enlisted the help of former presidents Bill Clinton and George H.W. Bush to raise additional voluntary contributions, much as they did after the 2004 Indian Ocean earthquake and tsunami. FEMA provided housing assistance (rental assistance, trailers, etc.) to over 700,000 applicants - families and individuals. However, only one-fifth of the trailers requested in Orleans Parish have been supplied resulting in an enormous housing shortage in the city of New Orleans. To provide for additional housing, FEMA has also paid for the hotel costs of 12,000 individuals and families displaced by Katrina through February 7, 2006, when a final deadline was set for the end of hotel cost coverage. After this deadline, evacuees were still eligible to receive federal assistance, which could be used towards either apartment rent, additional hotel stays, or fixing their ruined homes, although FEMA no longer paid for hotels directly. As of early July 2006, there are still about 100,000 people living in 37,745 FEMA-provided trailers. Law enforcement and public safety agencies, from across the United States, provided a " mutual aid" response to Louisiana and New Orleans in the weeks following the disaster. Many agencies responded with manpower and equipment from as far away as California, Michigan, Nevada, New York, and Texas. This response was welcomed by local Louisiana authorities as their staff were either becoming fatigued, stretched too thin, or even quitting from the job. 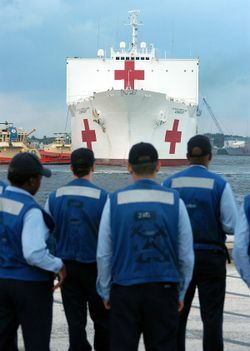 USNS Comfort takes on supplies at Mayport, Florida en route to the Gulf Coast. Two weeks after the storm, over half of the states were involved in providing shelter for evacuees. By four weeks after the storm, evacuees had been registered in all 50 states and in 18,700 zip codes - half of the nation's residential postal zones. Most evacuees had stayed within 250 miles (400 km), but 240,000 households went to Houston and other cities over 250 miles away and another 60,000 households went over 750 miles (1,200 km) away. Over seventy countries pledged monetary donations or other assistance. Kuwait made the largest single pledge, $500 million; other large donations were made by Qatar ($100 million), South Korea ($30 million), India, China (both $5 million), Pakistan ($1.5 million), and Bangladesh ($1 million). Cuba and Venezuela were the first countries to offer aid, in the form of $1 million, 1,100 doctors, 26.4 metric tons of medicine, two mobile hospitals, 10 water purifying plants, 18 generators, 20 tons of bottled water, 50 tons of canned food and 66,000 barrels of heating oil. Their offers were refused by the U.S. government. Countries like Sri Lanka, which was still recovering from the Indian Ocean Tsunami, also offered to help. Countries including Canada, Mexico, Singapore, and Germany sent supplies, relief personnel, troops, ships and water pumps to aid in the disaster recovery. Britain's donation of 350,000 emergency meals did not reach victims because of laws regarding mad cow disease. Russia's initial offer of two jets was declined by the U.S. State Department but accepted later. The French offer was also declined and requested later. Despite receiving aid from around the world, there was also a heavy dose of criticism from around the world including accusations of racism that were revealed at the international level across global press. Quotations from the UK Mirror such as "Many things about the United States are wonderful, but it has a vile underbelly which is usually kept well out of sight. Now in New Orleans it has been exposed to the world." were common. The American Red Cross, Southern Baptist Association, Salvation Army, Oxfam, Common Ground Collective, Emergency Communities, and many other charitable organizations provided housing, food, and water to the victims of the storm. These organizations also provided an infrastructure for shelters throughout Louisiana and other states that held thousands of evacuees. They were not, however, allowed into New Orleans proper by the National Guard for several days after the storm because of safety concerns. These organizations raised $4.25 billion in donations by the public, with the Red Cross receiving over half of the donations. Volunteers from amateur radio's emergency service wing, the Amateur Radio Emergency Service, provided emergency communications for federal, state and local officials. Over 1,000 volunteer operators traveled to affected areas to provide communications in areas where the communications infrastructure had been damaged or totally destroyed, relaying everything from 911 traffic to messages home. In Hancock County, Mississippi, ham radio operators provided the only communications into or out of the area, and even served as 911 dispatchers. United States Navy personnel unload Canadian relief supplies from a Canadian Air Force transport aircraft in Pensacola, Florida. Many corporations also contributed to relief efforts. On September 13, it was reported that corporate donations to the relief effort were $409 million, and were expected to exceed $1 billion. During and after the Hurricanes Katrina, Wilma and Rita, the American Red Cross had opened 1,470 different shelters across and registered 3.8 million overnight stays. A total of 244,000 Red Cross workers (95% of which were non-paid volunteers) were utilized to provide sheltering, casework, communication and assessment services throughout these three hurricanes. In addition, 346,980 comfort kits (which contain hygiene essentials such as toothpaste, soap, washcloths and toys for children) and 205,360 clean up kits (containing brooms, mops and bleach) were distributed. For mass care, the organization served 68 million snacks and meals to victims of the disasters and to rescue workers. The Red Cross also had their Disaster Health services meet 596,810 contacts, and Disaster Mental Health services met 826,590 contacts. Red Cross emergency financial assistance was provided to 1.4 million families, which encompassed a total of 4 million people. Hurricane Katrina was the first natural disaster in the United States that the American Red Cross utilized their "Safe and Well" family location website. New Orleans' levee failures were found to be primarily the result of system design flaws, combined with the lack of adequate maintenance. Those responsible for the conception, design, construction, and maintenance of the region's flood-control system apparently failed to pay sufficient attention to public safety, according to an investigation by the National Science Foundation. According to new modeling and field observations by a team from Louisiana State University, the Mississippi River Gulf Outlet (MRGO), a 200-meter (660 ft) wide canal designed to provide a shortcut from New Orleans to the Gulf of Mexico, helped provide a funnel for the storm surge, making it 20% higher and 100%-200% faster as it crashed into the city. St. Bernard Parish, one of the more devastated areas, lies just south of the MRGO. The Army Corps of Engineers disputes this causality and maintains Katrina would have overwhelmed the levees with or without the contributing effect of the MRGO. On April 5, 2006, months after independent investigators had demonstrated that levee failures were not caused by natural forces beyond intended design strength, Lieutenant General Carl Strock testified before the United States Senate Subcommittee on Energy and Water that "We have now concluded we had problems with the design of the structure." He also testified that the U.S. Army Corps of Engineers did not know of this mechanism of failure prior to August 29, 2005. The claim of ignorance is refuted, however, by the National Science Foundation investigators hired by the Army Corps of Engineers, who point to a 1986 study by the Corps itself that such separations were possible in the I-wall design. Additionally, various conspiracy theories began floating around that the levees were in fact deliberately demolished. The most commonly cited culprit in these conspiracy theories is the UNESCO Biosphere program, in an attempt to "re-wild" the region. These theories arose when several New Orleans residents described hearing "explosions" coming from the levees before the floodwaters rushed in, and by a National Guard worker who claims he was sworn to secrecy upon finding explosives residue at the site of the break. The criticisms of the government's response to Hurricane Katrina primarily consisted of condemnations of mismanagement and lack of leadership in the relief efforts in response to the storm and its aftermath. More specifically, the criticism focused on the delayed response to the flooding of New Orleans, and the subsequent state of chaos in the Crescent City. The neologism Katrinagate was coined to refer to this controversy, and was even a runner-up for "2005 word of the year." Within days of Katrina's August 29, 2005 landfall, public debate arose about the local, state and federal governments' role in the preparations for and response to the hurricane. Criticism was prompted largely by televised images of visibly shaken and frustrated political leaders and of residents who remained in New Orleans without water, food or shelter. The deaths of citizens by thirst, exhaustion, and violence days after the storm itself had passed also fueled the criticism, as did the treatment of people who had been evacuated to facilities such as the Superdome. Others alleged that race, class, and other factors could have contributed to delays in government response. The percentage of black victims among storm-related deaths (49%) was below their proportion in the area's population (approx. 60% ); nonetheless, criticisms focused mostly on the response after the initial flooding (i.e. after most of the deaths had already occurred). One notable event occured when Jack Strain, sheriff of nearby St. Tammany Parish told reporters "I don’t get into calling people names and all that fact, but if you’re gonna walk the streets of St. Tammany Parish with dreadlocks and 'Chee Wee' hairstyles, then you can expect to be getting a visit from a sheriff’s deputy." The comments, widely criticized as racist by the Southern Poverty Law Centre and other groups and individuals, were made in reference to possible plans to temporarily relocate poor black residents of New Orleans' public housing. The government was accused of making things worse, instead of making things better—perhaps even deliberately—by preventing help by others while delaying its own response. In accordance with federal law, President George W. Bush directed the Secretary of the Department of Homeland Security, Michael Chertoff, to coordinate the Federal response. Chertoff designated Michael D. Brown, head of the Federal Emergency Management Agency, as the Principal Federal Official to lead the deployment and coordination of all federal response resources and forces in the Gulf Coast region. However, the President and Secretary Chertoff initially came under harsh criticism for what some perceived as a lack of planning and coordination. Eight days later, Brown was recalled to Washington and Coast Guard Vice Admiral Thad W. Allen replaced him as chief of hurricane relief operations. Three days after the recall, Michael D. Brown resigned as director of FEMA in spite of having received praise from Bush with the now-well-known phrase, "You're doing a heck of a job." Subsequently, criticism from politicians, activists, pundits and journalists of all stripes has been directed at the local and state and governments headed by Mayor Ray Nagin of New Orleans and Louisiana Governor Kathleen Blanco. Nagin and Blanco were criticized for failing to implement New Orleans' evacuation plan and for ordering residents to a shelter of last resort without any provisions for food, water, security, or sanitary conditions. Perhaps the most important criticism of Nagin is that he delayed his emergency evacuation order until 19 hours before landfall, which led to hundreds of deaths of people who (by that time) could not find any way out of the city. The destruction wrought by Hurricane Katrina has raised other, more general public policy issues about emergency management, environmental policy, poverty, and unemployment. The discussion of both the immediate response and of the broader public policy issues may affect elections and legislation enacted at various levels of government. The storm's devastation also caused a Congressional investigation, which found that FEMA and the Red Cross "did not have a logistics capacity sophisticated enough to fully support the massive number of Gulf coast victims." Additionally, it placed responsibility for the disaster on all three levels of government. An ABC News Poll conducted on September 2, showed slightly more blame is being directed at state and local governments (75 percent) than at the Federal government (67 percent), with 44 percent blaming President Bush's leadership directly. A later CNN/ USATODAY/ GALLUP poll showed that respondents disagreed widely on who is to blame for the problems in the city following the hurricane — 13 percent said Bush, 18% said federal agencies, 25% blamed state or local officials and 38% said no one was to blame. Because of the large loss of life and property along the Gulf Coast, the name Katrina was officially retired on April 6, 2006 by the World Meteorological Organization at the request of the U.S. government. It was replaced by Katia on List III of the Atlantic hurricane naming lists, which will next be used in the 2011 Atlantic hurricane season.